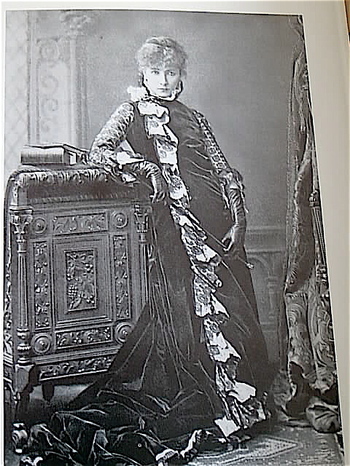 Victorian beetle wing dress worn by Ellen Terry in 1888. 1000 beetle wings is what it took to make this dress. Can't help but wonder, did they really count them all? Yikes. It took over 75K to restore this stunning dress of iridescent beetle wings, originally worn by the Victorian actress Ellen Terry in 1888. Click HERE to read all the details on how this was done and for pics of what this amazing dress looks like today. Recently I was trolling around my favorite local flea market. I had headed over there late. Late, meaning that I arrived well after all the good stuff had been picked over. Or at least I hoped. This way there would be less to tempt me from money I shouldn't be spending any which way. Before I left I made sure to pick up a 20 pack of Scott toilet paper for $11. This was also to help myself from feeling guilty about wandering the flea market. I had to go in order to save money right? As I meandered about I heard a dealer shouting "Everything $1 or less!" Peeking and poking through dusty boxes I got the feeling that damn it, I should have been there earlier. Y'know, when the stuff left behind looks kind of good and you wonder what the heck you missed by not being there early like you really have been. I reached down and pulled out a large hardback book and quickly glanced through it's pages. Yay. It was choc full of black and white photos of Dorothy & Lillian Gish. I remember paying $1 for the book and a small handful of other things. Funny, but now I can't even recall what those other things were. Holy moly. I never get lucky like this! It's autographed by Lillian Gish!!!! If you are a big old movie movie buff like I am you can imagine my glee. 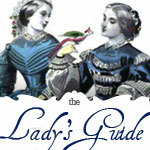 Written by Lillian Gish, it tells the marvelous tale of her and her sister Dorothy in early movie pictures. This book is so full of delicious photos that I would have been thrilled to have it in my collection without the autograph. 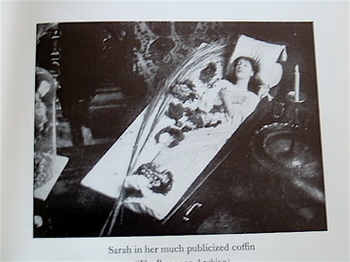 This delightful picture below is of their mother. This next scene from a movie especially tickles my fancy because of the wonderful textile covering the table. I just love stuff like this. 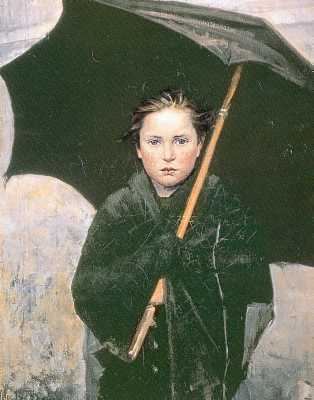 to see. I had a huge one once that acutally had the image of a child riding a St. Bernard. Sold it. What a big dummy I am. Oh my. Took me two days to post these. My fingers are done for awhile. I'm not bothering to check for mistakes. 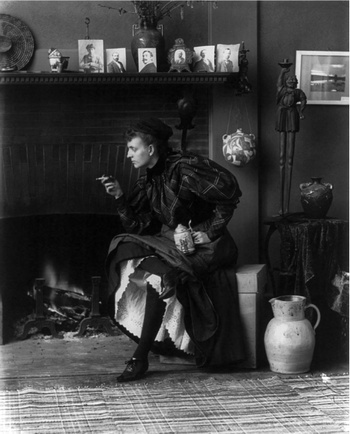 This photo of Frances Benjamin Johnston mesmerized me as a young girl. Who are those people on the fireplace? If only I could get a better look at that piece of pottery hanging from the wall. 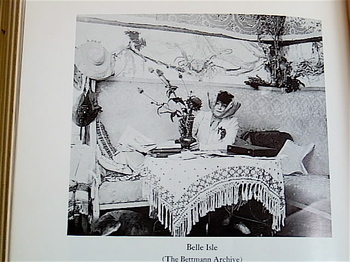 Even now I can recall how fascinated I was by the fact that so much in this picture, flew in the face of everything I thought I knew about women in the Victorian age. How did she have the guts to be so scandalous? 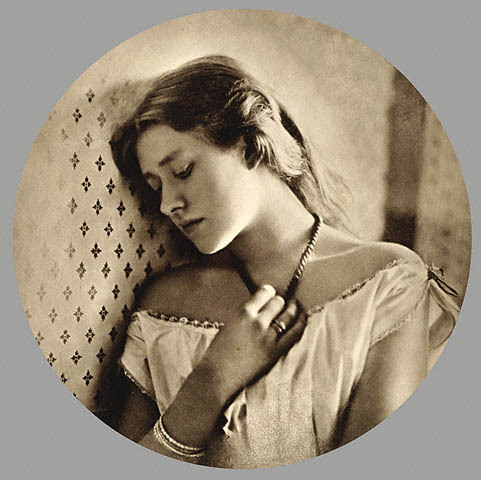 Exactly what possessed her to photograph herself in this manner? 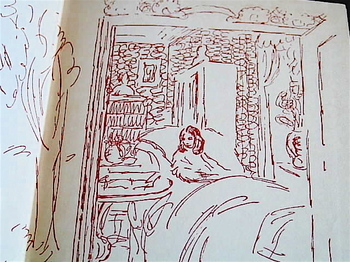 Was it spontaneous or did she plan these scene carefully as she lay awake at night? My mind is spinning and now I'm wondering who I would consider to be her contemporary in the here and now. I like to think that had I lived during the same time period that I would have been blazing my own unique path in life. Easy to say. I tried soooo hard to be good today and NOT go to one yard sale. Or the flea market. Or an estate sale. I'm weak. On the way to breakfast, I opted to brake and take a quick run through a church rummage sale just around the corner. Immediately to my left I spy several tables covered and buried in books. I glanced quickly and saw what appeared to be mostly 70's-80's covers and what looked to be a few from the 40's. 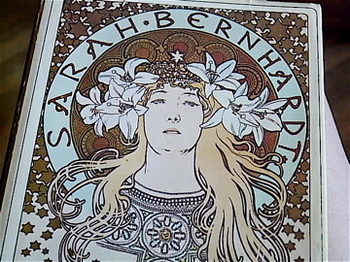 A truly wondrous book on the actress SARAH BERNHARDT. 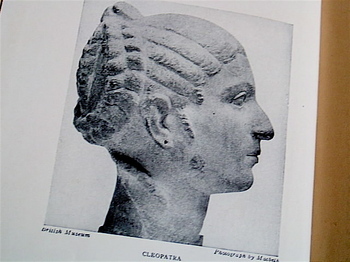 And while I was looking for a great link to post on Ms. Bernhardt I discovered this incredible bit on actress who have portrayed Cleopatra throughout the years, on YOUTUBE. Thanks zieggeldgrrl for sharing this. You picked the perfect music to go with it. I daresay that I have always thought that she had some of the most mesmerizing eyes. Like Ben Kingsley. I find his eyes to be very intriguing as well. 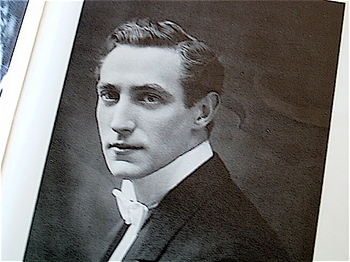 This handsome creature, a Mr. Leo Tellegen, is listed as her very last leading man. 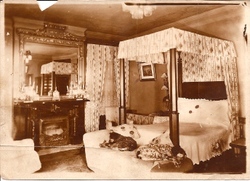 As I know I've mentioned somewhere before, I do love old interior shots. How I wish I could see this photo in blooming color. 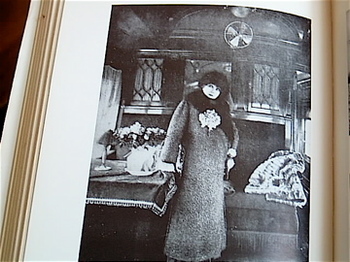 This photo was taking as she posed in her very own private train car. 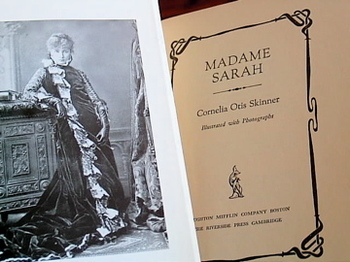 And right after I discovered the book on Sarah Bernhardt I unearthed a book from the 1920's on the life and times of Cleopatra. By this time I'm already figuring that I had better pay very close attention to the rest of the books because someone out there had similar interests. Hopefully many of the books had come from the same place right? 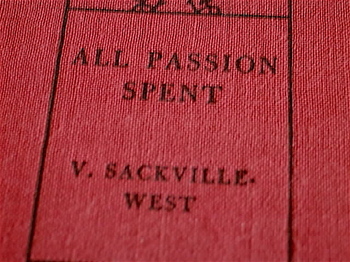 "All Passion Spent" by Vita Sackville-West. 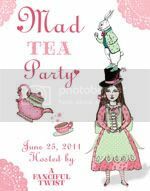 I've added a link about Vita off to the left of my blog under INTERESTING SITES TO CHECK OUT. 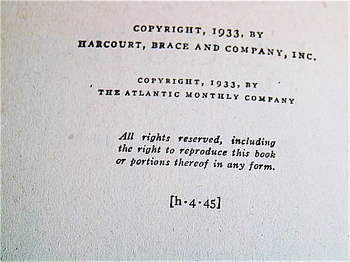 I thought that I had posted a link for more information about Virginia Woolf but I guess not. I'll try to do that soon. If I hadn't already been on my knees pawing through a dust covered cardboard box, my knees would have buckled. 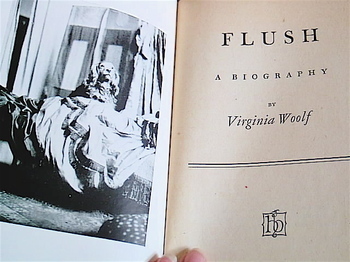 "Flush" A Biography by Virginia Woolf? Discoverd together even in death. By the time I got myself up from my hands and knees I found myself to be in the midst of a book lovers frenzy. There had to be at least 10 others digging about the tables and boxes and it was getting difficult to continue the hunt. I also had completely forgotten my poor husband who hadn't slept in 24 hours. I'm so bad. And selfish. The poor thing was napping by the time I figured out where he had parked the car. I was so excited and rambling on like a babbling brook about my treasures that my hubby just busted out laughing in my face. But what a great unexpected treat! Don't know about anyone else but each and every one of these books are just the thing to get me giddy. there are several others that I want to share but sorry! I want to curl up with one of em even more. Actually book reading my have to wait as well. Hyacinth of Keeping up Appearances is on my telly and beckoning! Ok I'm back for a little bit. Wasted nearly the whole day getting papers together, making copies, writing letters. I'm wrestling two companies that I paid services for over a year ago and of course now they are automatically charging me for the coming year. Sometimes it is very difficult to get "automatic" withdrawals to STOP. Be very careful!! Wow. Those came out big. 20 cents? Can you imagine. Certainly before my time. No, really. 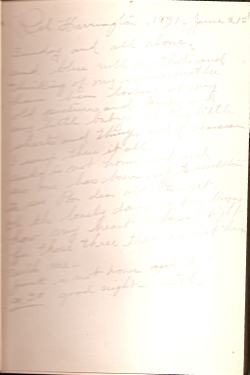 And while I'm on a melancholy note, I want to share something that I found in a turn of the century copy of poems by James Whitcomb Riley, discovered many years ago. 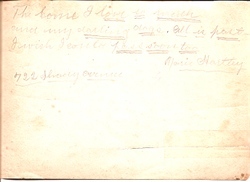 You can't actually read what is says from this dreadful scan. Well I'll be. I can't seem to locate my dreadful scan. It's too late to get out the camera. I'll add a photo tomorrow. I will type out what it says for you tonight though. I weep through it all. Andy is not home yet. Just breaks your heart doesn't it? I found the dreadful scan. It says "The house I love so much. My darling dogs. All is past. I wish I could pass soon too." Of course this really struck a cord with me. 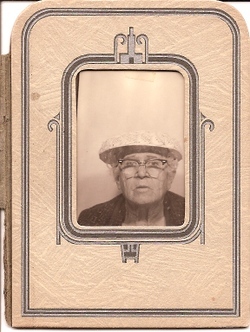 I then came across these photos of this dear elderly lady. I had to bring them home with me because I felt so sorry for the poor thing. 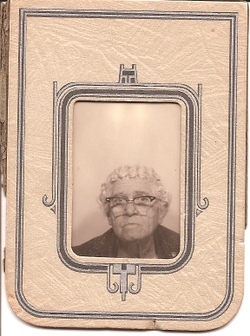 I guess that some of us are destined to wind up lost in a pile of photo's at the flea market. Darn. Gotta keep this short today. I'll finish this 2morrow night. Have a great weekend!